Sputnik: Is it not problematic perhaps for the US to be using an outdated policy such as the Monroe doctrine, from 1820s America, and applying it to the modern multipolar world? Well, you're absolutely right, but the Monroe doctrine was the way that Pompeo and Bolton managed to persuade Trump to sign off on their policy. Trump's ideas are America first, America gets to do whatever it wants and Latin America is America's backyard. And so when Pompeo and Bolton brought up the Monroe doctrine it obviously appealed to Trump's way of thinking. But as you know, the Monroe doctrine does not say that Latin America is America's backyard, all that the Monroe doctrine states is that any further expansion of European colonization in the New World would be treated as a hostile act. Sputnik: George also commented on the lack of criticism of Bolton's comments, even amongst US liberals and the democrat party. What's really interesting is that it when Bolton brings this up, it doesn't arouse a great deal of protest in the United States, not even among liberals or the Democratic party. If you remember two or three years ago both Obama and John Kerry were condemning Russia, they said 'Russia's actions in Ukraine show that they're still living in this world of the 19th century or 20th century' and said, 'well the days of the spheres of influence are over', and all the policymakers in Washington nodded their heads, but here they are quite happy to go along with Bolton! I don't know whether it's going to be successful to be honest because most of the military is Chavista and they are very loyal to the revolution. In which case I think the Americans will move on to phase 2, which will probably be some kind of guerrilla war launched from Colombia and Brazil. 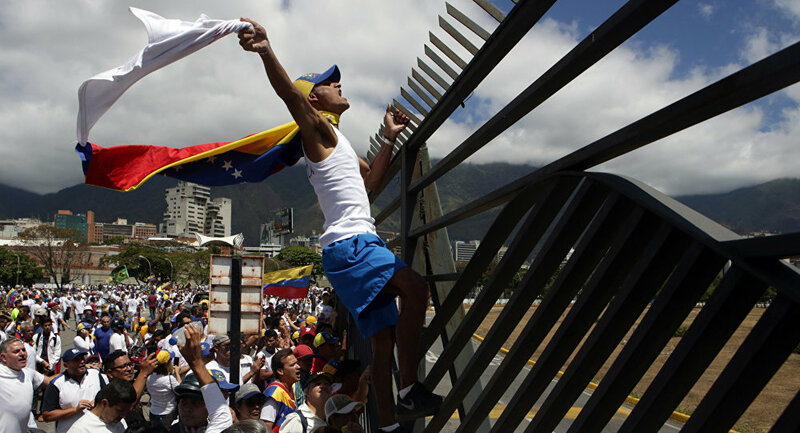 Sputnik: It will be difficult for the US to get UN approval for any planned intervention in Venezuela, as Russia is likely to veto any proposals which would harm Venezuela's sovereignty. George said he thought this would not stop the US from pursuing its regime change policy, however, and he suggested that it might adopt a strategy similar to the one adopted in Ukraine in 2014. It will more likely be some kind of Maidan, Racak, Markale scenario whereby some sort of horrific atrocity is staged and then Maduro is blamed for that and then Americans scream that Maduro is a mass murderer and we must intervene to stop this mass murderer in his tracks, this is a tried and tested CIA tactic, they tried it in Ukraine, they tried it in Yugoslavia.